After a negative start to the year, I’m looking to get back on track as the UFC heads to Fortaleza, Brazil, this weekend. Here are my breakdowns of the fights that I’m planning to bet. Why would I bet this ridiculous fight, you may ask? It could certainly be a bad idea, but I feel I have an angle. Fighting out of Suriname is Jairzinho Rozenstruik, an experienced kickboxer but relatively green MMA fighter. On the feet, Rozenstruik is solid. He has a good vocabulary of strikes, nice low kicks and big power. While I couldn’t find any information about his reach, I think Rozenstruik will be the longer fighter and I anticipate he’ll want to keep this fight at distance where he’ll presumably have an advantage. On the ground, the Suriname native looks terrible. Against Ukrainian fighter, Andrey Kovalev, Rozenstruik showed a total lack of competence on his back and will be in big trouble if he finds himself in the same position against Junior Albini (who is a jiu-jitsu brown belt). While Albini didn’t perform brilliantly in his last two losses, I’m not sure they have much relevance to this fight. He throws good combinations and should be the more well-rounded fighter. His recent move to American Top Team should also be positive for “Baby”. I don’t know how good Albini is at wrestling, but I can’t imagine the ATT coaches will instruct him to go and bang it out with a decorated kickboxer. Surely the strategy will be to take his opponent to the mat and exploit a blatant weakness. At range, Albini may be at a disadvantage, but if he’s able to close the distance I think he can operate well in the clinch and against the wall. This could also drain the gas tank of Rozenstruik, which looked suspect in the aforementioned fight with Kovalev. It’s worth noting that the arena is going to be very humid, which could be an issue for fighters with poor cardio. I wouldn’t wager anything significant on this fight, but I do think Junior Albini is the right side at pick ‘em odds. There is a lot of hype on Johnny walker and to be honest, I don’t feel it’s justified. The hulking 6’5 light heavyweight is fresh off a win over Khalil Rountree – a fighter with a big left hand and little else. In his previous Contender Series bout, he defeated Henrique da Silva – a fighter with no striking defense, no takedown defense and one round of cardio. In fact, the only good fighter on his record (that I recognize) is Wagner Prado, who marched him down and beat the crap out of him. Walker is highly explosive and has numerous finishes in the clinch. However, he’s wasteful with his energy – throwing his entire body into strikes and deploying low percentage techniques. He rarely connects with those axe kicks and spinning wheel kicks, although they do look exciting from a fan’s perspective. Justin Ledet was dominated in his last fight, but I think it says more about the talent of Alexander Rakic than anything else. Ledet absorbed a lot of low kicks, which he needs to work on, but other than that I think the loss was excusable. Rakic looked phenomenal and integrated his grappling excellently, which I don’t think Ledet was prepared for. At his best, Ledet is a boxing stylist with a crisp jab. Sometimes he relies on the jab a little too much, but he has a good right hand when he decides to throw it. If he’s able to deal with the low kicks and clinch attacks from Walker, I firmly believe Ledet is the more competent striker. He’s certainly more energy efficient with his shots, which will pay dividends if Walker starts to fade. As far as the grappling goes, I don’t know who has an advantage. Ledet didn’t look good off his back in his last contest, but he actually started training jiu-jitsu before boxing. Still, I think this will mostly transpire on the feet. I can’t predict who is going to win this fight, but I do feel that there is significant value on Justin Ledet as a +200 underdog (plenty of sizable underdogs hit in 2018). One of the most lethal submission artists in the UFC, Charles Oliveira, provides an interesting stylistic challenge for Swedish kickboxer, David Teymur. Oliveira is a high level jiu-jitsu black belt with seventeen submission wins on his record. He’s so comfortable on the mat that he doesn’t care if he ends up on his back, which helps when it comes to securing takedowns. For a jiu-jitsu practitioner, Oliveira has good wrestling. He scored a beautiful reactive shot against Christos Giagos, and is always looking to duck underneath a wild punch and latch onto a body lock. Sometimes Oliveira’s opponents are too willing to engage him in the pocket where he can grab hold of them, but that won’t happen here. David Teymur is one of the best examples of a striker who has integrated anti-grappling into his standing style. He always angles off when he’s close to the fence, doesn’t hang out in the pocket and is ready to sprawl at any moment. Although we don’t know too much about his submission defense, the Swede is excellent at getting back to his feet in the rare instances when he’s taken down. So long as he doesn’t give up his back in a scramble, I think he’ll be able to get up in this fight too. On the feet I believe this is a mismatch. Oliveira is not a bad striker by any means, but he stands very rigid with his hands high – which will open up the body shots and leg kicks for Teymur. We’ve also seen Oliveira implode in the face of adversity, and that could happen again if he’s forced to stand for too long with a superior striker. I cap the Swede around -175, so I have no problem playing David Teymur at +100. 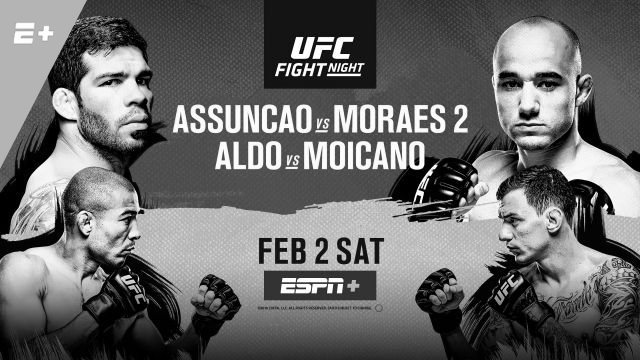 Can former featherweight champion, Jose Aldo, defend his position against surging contender, Renato Moicano? I really like Moicano as a fighter and I’ve won good money betting on him as an underdog against Jeremy Stephens and Calvin Kattar. As a jiu-jitsu black belt, Moicano has rounded out the rest of his game and is now an excellent striker too. On the feet, his best weapons are his jab and low kicks. Not blessed with concussive power, Moicano likes to use his length and movement to frustrate more compact opponents from the outside. With some takedowns mixed in, this strategy worked excellently against Stephens. Here is the problem though. Jose Aldo has some of the best takedown defense in UFC history, which means Moicano’s best path to victory is striking at range for a victory on points. Unlike Kalvin Kattar (who doesn’t check leg kicks), Aldo has some of the best low kicks in the game and going kick for kick with him seems like a bad proposition. Some say Aldo is washed up since being finished twice by Max Holloway, but I don’t buy it. Watching those fights, Aldo was a match for Holloway in terms of technical striking – but couldn’t match the pace of the young Hawaiian. That won’t be an issue here. Aldo is still an extremely dynamic striker with great hands, savage low kicks and also importantly, good head movement – which will help him to deal with the jab of Moicano. Could Moicano pick Aldo apart at range? It’s possible. I think it’s more likely Aldo gets his low kicks going, starts countering Moicano’s jab and forcing his opponent into his type of fight. I have some action on Jose Aldo at +140 as I cap him as a slight favorite. Currently he’s at +105 where I wouldn’t be as enthusiastic to play him. Raphael Assuncao walked away with the decision victory the first time these two met, but I felt it should have gone the other way. In my opinion, Moraes did the better work throughout the fifteen minutes (although Assuncao had the big moments in rounds one and three). Moraes is a supremely dynamic striker and long-time training partner of Edson Barboza. His finishes of Jimmie Rivera and Aljamain Sterling were both spectacular. While Moraes is a jiu-jitsu black belt, he’s primarily happy to contend on the feet. I think we probably see a striking match again, although Assuncao has showcased a strong grappling game throughout his UFC career. At 36-years-of-age and known for his conservative style, I don’t think the UFC wants to give Assuncao another crack at TJ Dillashaw. You also figure that a five round fight favors the younger fighter in Moraes. Skill for skill, both fighters are closely matched. I just believe Moraes has the more dynamic offense, youth and speed advantage. I can’t blame anyone for stabbing Assuncao at +200, but at +150 I’m not as excited. I’ll probably pass on this fight but if I can get Moraes as a slight favorite, I’ll reconsider. Are you looking to maximize your betting profits? 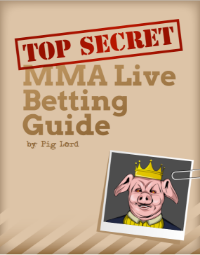 Check out my free MMA Live Betting Guide.